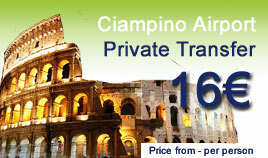 Rome Ciampino airport is located on the Via Appia Nuova, 20 km from the centre of Rome. Ciampino airport is very busy due to the strong activity of Ryanair and Icelandair - This transfer is private and must be booked at least 48 hours in advance of your travel date. It means that the price remains the same for a group of 1 to 8 people. The more you are and the less you pay per person. Confirmation for this product will be received at time of booking. The duration of transfer is about 1 hour but remains approximate : The exact duration will depend on the time of day and traffic conditions. Transfer is operated in comfortable air conditioned vehicles with courteous English speaking drivers. Please click on the "Ciampino Airport Transfer" button and select the airport shuttle you need either Arrival pick up or Departure. Transfer from Airport to Hotel : You arrive to Rome and want to go to your hotel in the heart of the city. Transfer from Hotel to Airport : You leave Rome and want to go to the FCO airport.